Just a quick one today! 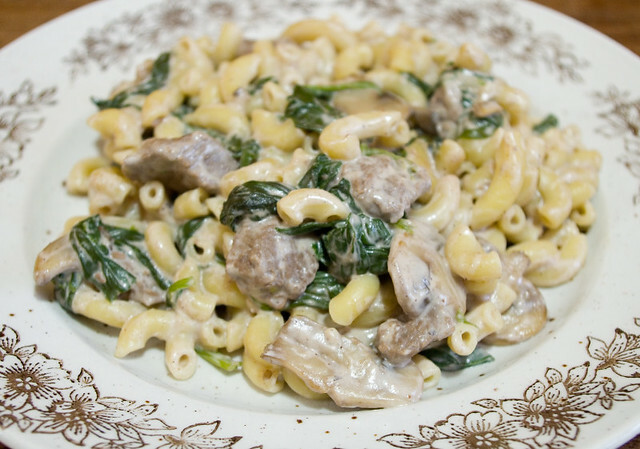 At the suggestion of a friend of mine, I added a bag of baby spinach to my beef stroganoff, and it turned out great! If you’re not really into spinach, the sauce really covers up the bitterness. Now, I actually like the taste of spinach, but I like that it doesn’t overwhelm the flavour of the rest of the dish. I’m always looking for ways to make my cooking healthier (as well as tastier), and one of the best way to do this is to add vegetables. I know that I definitely don’t get enough leafy greens in my diet. This is just one way to incorporate them! Posted on March 28, 2018 March 27, 2018 by owntwohandsblogPosted in CookingTagged dinner, easy, food, greens, healthy, mushroom, mushrooms, pasta, simple, spinach, supper, vegetables.